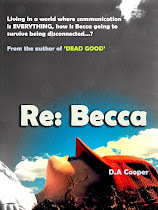 Debs Riccio: Me - In Interview! Strictly Writing, the other site I write for, is stuffed full of fabulous people. Not least the other members of the Strictly Team, without whom the dark writing days would seem bleaker. But by far the best people on the Strictly site are our gamut of lovely followers. And after I'd announced my recent foray into self-publication, one loyal follower, Derek, invited me to guest post on his blog, here: 'Along The Write Lines' . And so, *clears throat* I give you.... ME. being interviewed (I know - mental, isn't it?!). Ooh! That's so exciting! I would love to be interviewed! Congrats on being interviewed btw!